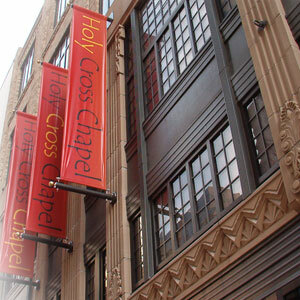 Visit Holy Cross Chapel in Downtown Houston Today! If you work in Downtown Houston and would like to have a place to simply spend a few moments in silence or prayer, feel free to stop by the Holy Cross Chapel. People from all denominations are welcome! If you are Catholic, then you will find additional benefit from the Chapel as a place where you can attend weekday mass, go to confession, browse a bookstore full of solid and trustworthy Catholic doctrine and literature, have access to regular spiritual direction from holy and excellent priests, and receive good formation to foster spiritual growth and a stronger relationship with God... all conveniently located within close proximity to your workplace. Holy Cross Chapel and Catholic Resource Center will host a men's breakfast and study forum on "Finding God in Your Work." All men are invited to Holy Cross Chapel on Wednesday, April 17, from 7:30 p.m. to 9:30 p.m. for an evening of spiritual talks, Adoration of the Blessed Sacrament, Confession, and Spiritual Direction. If you like to give a special gift for someone, please consider having a Mass in honor of that Special Someone for their Birthday, Anniversary or just because. There are Masses available throughout the month of May 2019 and beyond! 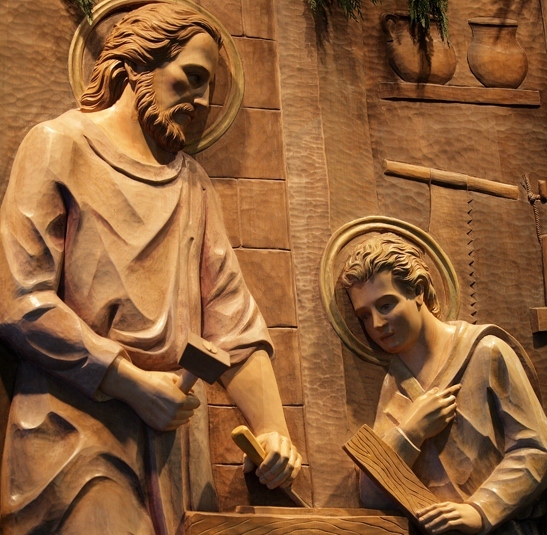 Read "What does it mean to have a Mass 'offered' for someone?". Please join us each Friday during Lent after the 12:15 p.m. Mass. Holy Cross Chapel will host the Women's Lenten Series on Tuesdays starting March 19 from 12pm - 1pm. All women are invited to join our journey with Christ during Lent through “Conversations with St. Josemaria Escriva” on Women in the Social Life. The theme is "Women Walking with Christ: Lenten Companions, Then and Now." This lunchtime series will be presented by different speaker each week. Lunch is provided. Mass is celebrated Monday through Friday at 11:35 a.m. and 12:15 p.m. Confessions are available weekly from 9:15-11:15am and 2:00-3:30pm. Please call ahead for Priest’s availability. More on activities at the Chapel. Daily homilies are recorded and available for listening and reference. Read book reviews of noteworthy books available in our bookstore. See a list of recommended websites and apps. More on our online resources. If you'd like to receive the Weekly Bulletin and other announcements via email twice a month please join our email list.